Retail Management Hero’s RMH Loyalty is flexible, powerful and user-friendly, with three types of point collection and seven types of point redemption. You can refine your own rules for collecting and redeeming points and tailor to fit your needs and customer base. 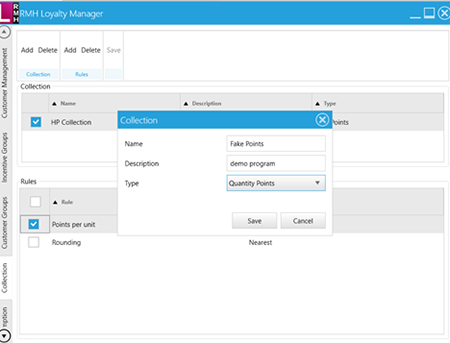 This article assumes you have already installed and configured Retail Management Hero (RMH) for operational use. 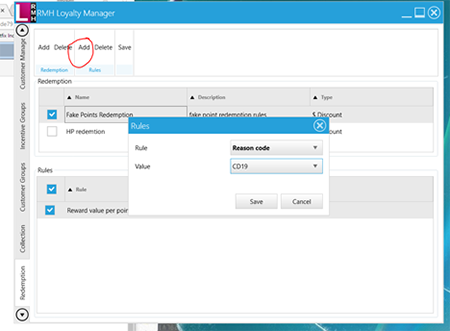 RMH Loyalty is a complimentary add-on (extension) to RMH POS Software. It is an on-premise software that is tightly integrated with RMH data, enabling you to create powerful customer loyalty programs and offer a wide variety of special incentives to your devoted customers. Flexible, powerful and user-friendly, RMH Loyalty offers three types of point collection and seven types of point redemption. You can refine your own rules for collecting and redeeming points and tailor to fit your needs and customer base. 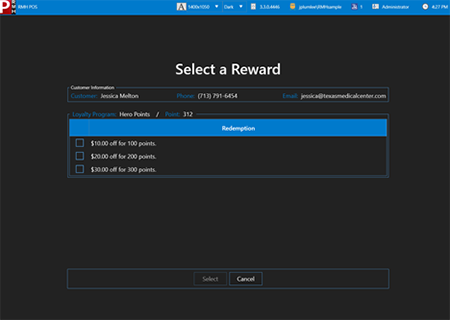 For this example, we are going to create a very basic loyalty program. This is best suited in a test environment until you are comfortable with the process and workings of the program. On the left side of the screen are the tabs you will need to select to create the loyalty program. Please note that the loyalty program requires at least one collection and redemption schedule (explained below). First, configure the collection tab. You will want to name your new loyalty program, and in this example, we called our program “Fake Points”. The second field will be a description of your program. The third field allows you to set what type of loyalty program you are creating. For this example, we will be using Quantity Points. Next, you will set the rule for point collection. Our sample uses points per unit, but you will have additional options as well. There are four ways to collect points, including purchased price (price points), purchased quantity (quantity points), transaction subtotal (basket) and any visit (quantity points). We will save our sample at 1.00 per unit, meaning customers would earn one point for every $1 they spend. Click Save. 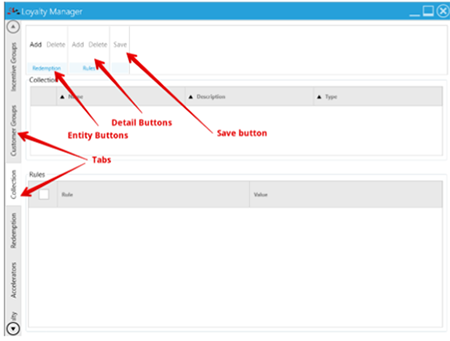 Make sure to hit save at the top of that page periodically through this creation process in order to save your work as you go. After setting the collection rules, we will move on to the redemption tab. 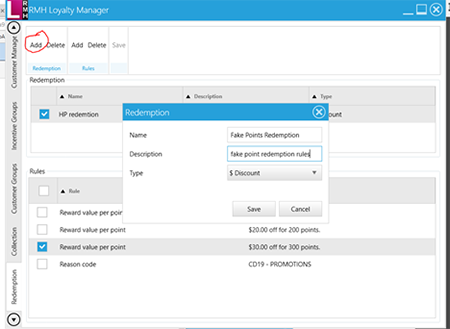 You can configure loyalty points redemption in seven ways, including dollar discount, percentage discount, subtotal offset, dollar coupon, percentage coupon, subtotal offset coupon and reward item (discounted or free item/gift). We’re going to navigate to the top and select the “Add” button again. 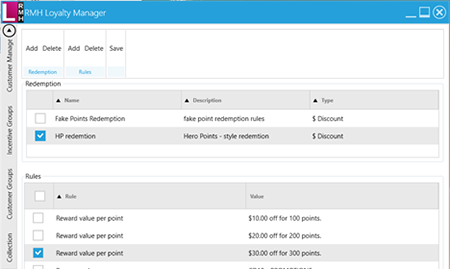 Name the redemption rule something pertaining to the loyalty program you created under the collection tab. This example uses “$ Discount”. It is common to set up programs with something like, “Spend $100 get $10 off your next purchase.” Click Save. Next, we have to make a rule for the redemption. Select “Add” under the rule box. 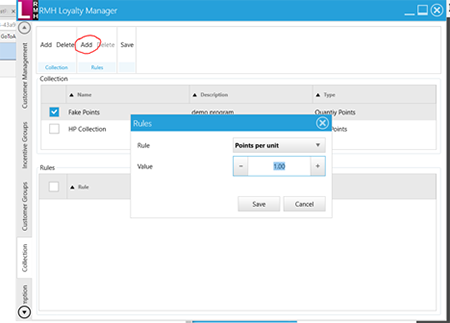 Select “Reward Value per point.” This example uses the standard rule of 100 points equals $10 off since in the Collection setup we gave $1 spent one loyalty point. You will have to make additional rules for what is to happen at 200 points 300 points and so on if you have customers generally spending that much. After you set the price point you want, you have to make a reason code for the discount. Retail Realm suggests using CD19 as the reason code because its a standard “Promo” code. Add another rule under the redemption tab using code CD19. It will prompt you asking if you want to save, and CLICK YES if you want to save your work. You cannot just close the prompt and continue editing, it will crash the program. 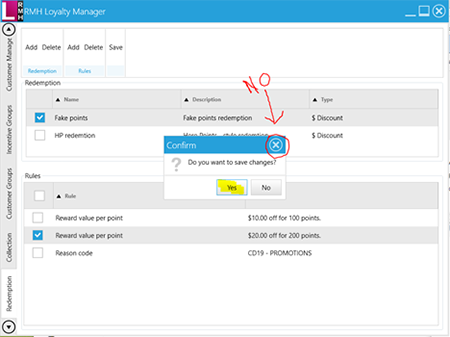 After saving your work you should now be able to test your loyalty program at the Point of Sale. Select a customer for the sale and make a purchase over $100. The next transaction for that customer should prompt you to use loyalty points for the transaction. 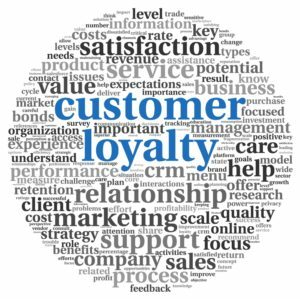 RMH Loyalty also has ways to configure item groups, customer groups, and run multiple loyalty programs at once by setting different types and rules and applying them to different items and customers. There are options for point accelerators such as Happy Hour (date/time span), Promo (date period), and more. If you are interested in purchasing Retail Management Hero for your store or setting up a loyalty program in your existing RMH system and need some guidance, New West Technologies would be privileged to be your trusted adviser. We can help walk you through this process, discuss your specific needs, and make our best recommendations for you today. ← What is Transport Layer Security (TLS)?